And What You Can DO To Reverse The Damage Caused"
The DANGERS of using BAD Backlinking Strategies will mean that your precious money making sites WILL drop in search engine rankings, get sand boxed/penalized and sent to the very last page in Google for your main keyword term. ALREADY one of my reviewers followed my steps and found their site ranked on the last page of Google for their main keyword term. They are now putting in the steps I recommend to reverse the damage caused and begin generating sales once again. It is evident from the testimonials coming in that many of us are still backlinking the wrong way which is causing us more harm than good. I have been there done that, found great keywords, great domains and great products but my weakness was in my backlinking. It was not until I had 2 dozen sites up and running that I realised there was a pattern starting to emerge. Every new site would be doing great for three months and all of a sudden the sites would start to fall off the search engines. Believe it or not! it was because of my backlinking. Many of us today are using these backlinking strategies that are still been taught and are wondering why their blogs are not performing? 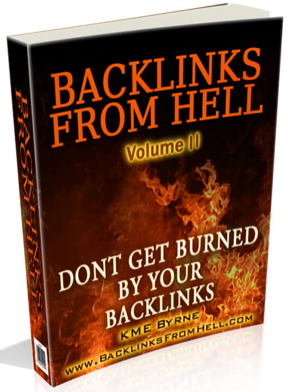 Well the answer lies within my e-book, Backlinks From Hell V2. By applying these life saving backlinking strategies that work in 2014 you will begin to see great results and increased sales. Every strategy in the e-book makes sense and is a must for every internet marketers side locker. DO you ever wonder why your backlink strategies are LOWERING your search engine rankings? Do you wonder whay your site is appearing on the last page of Google for its PRIMARY KEYWORD? DO you ever wonder why your secondary posts are our ranking your PRIMARY post in the search engine? BFH Outlines the MISTAKES that internet marketers are making these days when it comes to BACKLINKING. Purchase a copy now so that when you launch your next site, or start a new backlinking campaign you will actually be doing something constructive as opposed to destructive. Discover why hyperlinking your main keyword is actually destroying your business so that you can make changes that work in 2014. Discover why directly pinging your main URL is wrong and Discover the CORRECT METHOD… so that your site remains in the top positions and overnight ranking. Discover the Main Backlinking Mistakes that are still been taught so that you don’t have to make them. Understand how frequent you should be backlinking so that your site does not get penalized. Discover what to do to reverse the damage caused by poor backlinking in the past… so that you can start to build a successful backlinking campaigns. Discover what the correct protocol is to build links to NEW SITES so that you do not crush your business from day one. Discover what the correct timing of Backlinks Involves so that you do not doom your sites rankings before lift off. Discover what Backlinks We NEED Vs Backlinks We DONT need. Follow an outlined backlinking strategy involving, Article Directories, RSS Feeds, Press Releases, Podcasting, Commenting, Web 2.0, Video Submissions and Forums. I have created 3 case studies on differing backlinking strategies, the results speak for themselves. Free access to my SEO mastermind group with upwards of 1500 active members. Here you can discuss anything SEO related and get the latest tips and advice. I am only three quarters of the way through and I have to say WOW, it is definitely the best written and probably the only guide I will use for a long time to come. The rules/steps he lays out for you are not only simple and logical but are an outstanding formula for long term success which points out the short term pitfalls of all the other back linking strategies that I have been doing wrong so far . This is like the bible for dummies of correct back-linking and I am so glad I bought it and cannot wait to read the rest of it. He gives examples and even goes so far as to show you where to go for back links and what type of anchor text you should be using for your hyperlinks. Your mad not to buy this as it will clear up any confusion youve ever had on the subject newbie or experienced. You’ve got yourself a new fan here mate. This isn’t just a product that tells you what a backlink is and how to create one. It goes way beyond that. When you think you’ve read it all some clever guy thinks outside of the box. Kevin is that guy. His product is way outside that box. Everyone knows about backlinking and knows how to backlink but there is a very specific method and strategy that goes behind it. Now I know there is a method that most of us are not doing.Hi Kevin!I have to thank you for ‘bucking the trend’ and producing a WSO that not only "delivers" – but WAY OVER DELIVERS big time! The information you provide isn’t just for newbies -it is for everyone because of the skills and smart tips you explain in this guide go way beyond the traditional backlink thinking.You provide the answers to why sites drop in rank and end up on the last page of Google. And you clearly show in detail how to clean up the mess that most of us our making. As Kevin explains – it is how you link and what you link to is the biggest problem, the huge mistake so many of us are making every day. This WSO goes into huge detail, explaining how it is that we are all backlinking using hyperlinks and in return getting burned because we do not know how to use them. What I enjoyed about this WSO is that Kevin explains in detail the EXACT STRATEGIES I need to employ, IN DETAIL and broken down step by step - he made it so easy even a 10 year old could understand and do it, and do it well. The section on REVERSE DAMAGE caused through incorrect and inappropriate backlinking strategies was excellent – That was a dynamite section well worth any cost for this wso. What you will learn in this WSO WILL SHOCK YOU! Every day myself and probably most others are doing it completely wrong. Kevin shows you how easy it is to shield your sites from any Google slaps and exactly what to do to make your backlinks at least 100% more valuable to you. If you want shockingly easy first page Google rankings and to scream past your competition, this is the product for you. Once again you have provided us with an awesome tool to make our job of making a living online that much easier. You always keep adding more and more value to all your wso‘s and this one is one of your best. Keep it going! that I really didn’t understand backlinking at all! why the search engines respond favorably to linking in this manner. The process and need for techniques like this are clearly laid out and each step leads to the other. I can honestly say, you won’t need to get any other backlinking report after this. This is a complete guide that will become part of your arsenal of success for all your sites. If the course is expanded (which I can’t see how) I’ll followup with a review of that as well. All in all, this is a steal. But you won’t go to hell for it. When Kevin asked me to have a look over his latest WSO, “Backlinks from Hell” I was more than happy to give it a coat of looking at especially as he has had huge experience in WordPress Niche Blogging over several years. An interesting section, and, very appropriate it turned out, is how to reverse damage caused through incorrect and inappropriate backlinking strategies – very appropriate in that I’d just “lost” one of my old earning websites – usually on the first page of Google – Kevin told me where to find it and the explanation why it was where I found it – on the last page of Google! Also what “reverse” strategies to adopt to rectify the situation. The “what backlinks we need” and “what backlinks we don’t need” section leads on to how he examines the existing results in Google to arrive at a strategy to defeat the competition. Again he uses one of his own blogs to illustrate his actions. Additional chapters include how to perfect your backlinking strategies to suit your own blogs and the 10 steps he uses to generate backlinks and drive traffic. His bonus chapter on “creating a successful campagn” sums up everything to create a structure that you can follow and stick to when backlinking. In conclusion this eBook is short, 27 pages, but very much to the point and it clearly describes some of the very important processes within backlinking – well worth having as a reference document. Bought it – Read it – Liked it. Experienced IMers might know most of this stuff but even so it’s a great back linking blueprint if you are getting somewhat lost on why this or that is happening or what move to make next. ALSO!!! If you want to be an internet marketer… buy this not just for the link building info but follow the marketing structure of this WSO… EVERY STEP! Brilliant! That is an education in itself and FREE. Take notes at every move… write this **** down… model! I have read thoroughly BackLinks from Hell, and as with Kevin’s former products I can honestly say this one gives one a great insight on how BLs work and should be worked on. Kevin is certainly one of those and I have always found great response and ease of implementation with his products. Also he is not afraid to disclose shortcuts, as very few others do. Any reason for this I think Kevin is a generous person because every time I read or re-read sections of his courses, I find some little hint that adds to the whole value of his teaching. Everything is going great until they start their first Backlinking Campaign. For the value that is outlined within this book i could easily charge $27 TODAY but i am releasing this book as a special offer... FROM TODAY the price will be increasing from $9.90 up to $17.00, so the sooner you get in and secure your sites future the better. When this special offer is over (the launch week), I will be increasing the price of this book to $27 where it will stay.